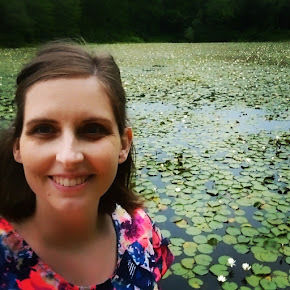 Today's reviewer is none other than Aislin! She's astute, adorable, and just generally awesome in real life -- and it looks like she has some book review skillz too! I am generally interested in books that are aware of themselves and their context as literature, and am entertained with the way modern writers enjoy putting new spins on canonical stories, so the idea of Detective Investigator Jack Spratt working on the case of Humpty Dumpty’s fall (suicide or homicide?) was delightful. I had no idea just how skillfully Jasper Fforde would bring this clever idea to life. Fforde’s past success has been with classic literature (The Eyre Affair, etc. ), but his most recent series “tumbles into the seedy underbelly of nursery crime.” One doesn’t need more than a cursory knowledge of basic nursery rhymes to enjoy this novel, but if the reader is familiar with classical mythology and an array of 20th century books, there are allusions on every page to be enjoyed. Fforde not only takes liberties with classic Mother Goose; he also pokes fun at our modern fascination with criminal investigation and forensics. 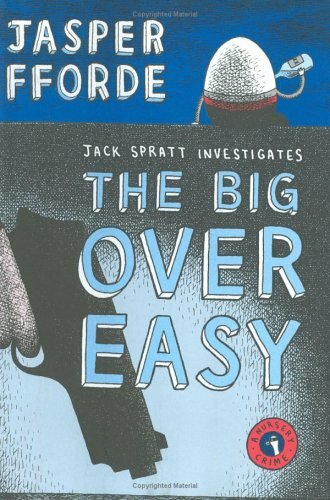 The Big Over Easy takes us to the community of Reading, where thinly veiled mock ups of famous literary detectives (Hercule Parrot, Miss Maple, Lord Peter Flimsey, etc.) are traipsing about in Sherlock Holmes’ wellies. Fame in crime-busting is dictated by publications in Amazing Crime Stories; the more dramatically a DI can solve a case, the more recognition they receive (tv serial adaptations guarantee good funding for one’s division). Jack Spratt is a nondescript family man with too many ethics and too few personal excesses for the interest of the media. Public opinion is set against him and his Nursery Crime division is heading for the chopping block, despite years of dedicated service. A feud with his old partner-turned-celebrity and the Guild of Detectives doesn’t help matters, but with the help of his new detective sergeant Mary Mary (a little contrary, but a good egg) Jack is determined to crack Humpty Dumpty’s secretive and sordid past to learn how and why he fell from the wall. Jasper Fforde’s trick to making this book interesting, action-packed, and smart, rather than just silly, is playing it straight. It reads like a CSI episode. The characters are not cartoons, and yet I found myself laughing out loud frequently. This is a clever, stimulating and refreshing read. A shout out to my sister Suzanne for recommending it. So, doesn't that sound like a ton of fun? I think I'm going to have to try it (after Cybils, of course)! I picked up The Eyre Affair once on Laura's recommendation, but couldn't get into it. Maybe because I've never read Jane Eyre? (Shh... don't tell! I mean to read it sometime!) Anyway, I've definitely read Humpty Dumpty! Heck, I can recite it from memory! Thanks for the review, Aislin!